Now that “The Fortune” is in the can and awaiting release on ILSE Music, it’s back to work on the shelved Bipediment Recordings releases that were placed on hold during post production of “The Fortune”. 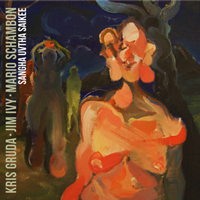 First up is a double CD release of raw power from a trio of myself, Kris Gruda, and Mario Schambon. The trio recorded the day after my first curated event in 2010 at Stardust Coffee and Video called WMD 1, which took place on August 7. WMD-1 was arranged so that each improvising performer was able to collaborate with the performer before them, play a solo piece, then perform with the next improviser, and so on. This made for interesting duos, as well as allowing everyone solo performances. Mario, whom I have known since the late 1990’s when we played together in Numb Right Thumb, was down here in Florida visiting from Atlanta. The show was initially set up so he and I could perform together. Kris Gruda, who has also been friends with Mario for some time, was added, and it grew from there. The session that took place the next night was set up by Kris at his rehearsal space. It was truly an epic evening of improvisation. I decided to title the CD “Sangha Uvtha Saikee”, phonetical spelling of sangha of the psyche, or loosely translated, brotherhood in consciousness. “Sangha Uvtha Saikee” will be available through the Bipediment online ordering service or directly from me on October 15, 2011. It is a double CD release costing a mere $7.00. This entry was posted in Improvisation / new music, upcoming release by jimivy. Bookmark the permalink.